It has no frills, no fuss, no anything except for all-natural, vegan-friendly goodness. It’s Just Plain Soap. I created this soap a couple of years ago to meet the demand for a moisturizing soap that’s well-suited for people who are sensitive to particular fragrances. Many people who claim they’re “allergic to soaps” aren’t allergic to soaps so much as they’re allergic to the synthetic chemicals in detergent bars, likely including the perfumes used in them, the artificial fragrances. Still, some people are sensitive to even essential oils, which are 100% natural and plant-derived. So, for all those people who prefer unscented, natural soaps, there is Just Plain Soap. An earthquake hit, and hundreds of thousands of people died. An earthquake hit a small island nation, and thousands more were injured. An earthquake hit, and hundreds of thousands more are without homes, without clothes, without food, without water. Then the call came – twice. The first came through the WSP Soap and Candle forums via a post echoing an article in Saponifier magazine. The second call came by email from Leigh O’Donnell, president of the Handcrafter Soapmakers Guild. The call came, and I answered it. With the high number of injured people in Haiti and poor sanitary conditions following the earthquake, disease and the spread of bacteria are now rising as serious problems on top of the problems already existent. The call that came through the HSMG and Saponifier magazine was for soap and lotions – soaps to clean skin, helping prevent the spread of diseases; and lotions to soothe dry, parched skin which, in turn, helps promote wound healing by keeping the skin supple. I didn’t think twice about it. 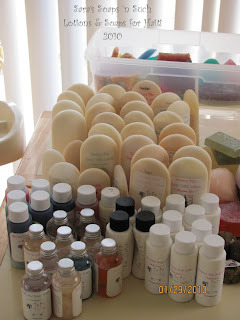 I had lotions that I’d made while we lived in Durham that were now over a year old, and I had soaps that were on clearance for the better part of last year that were cluttering up my website and taking up space on my soap shelves. I had a choice to make: I could keep these products for our own use, or I could send them to Haiti. They have a much greater need for soaps than we do. 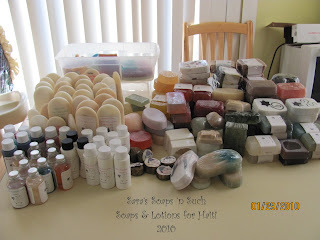 The above picture is of all the products that I sent to Haiti. I couldn’t tell you an exact count, but I’d guess there are close to 100 soaps there and over 40 lotions, in addition to close to 20 body washes. They went in two separate boxes to Haiti. 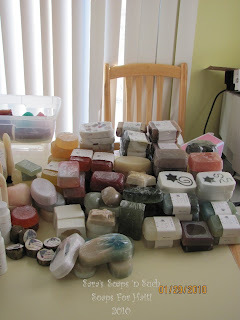 The weight of those soaps boxed up came to a full 33 pounds, and there wasn’t any packing material in the box; those 33 pounds were nothing but soaps and cardboard. That box went to Missionary Flights International to continue on to Haiti. All those unwrapped soaps and the lotions and body washes are heading to Haiti via Clean the World, an Orlando-based organization that sterilizes unwrapped soaps and lotions before sending them to countries where hygiene might be suspect. I ask for you to please pray for the people who will be receiving thes soaps and lotions. Pray for healing, nourishment and allow them to be reunited with family. Please pray for those at Clean the World and MFI who will be going through and sorting, And lastly, please pray for those medical teams that are down there now, helping and serving those most in need.